I ran into Kees van Rijssen (and his lovely family) while I was at the National Barista comp in QLD last weekend and he talked me into a trip up the mountain before my flight home. Its been a few years since I had been on Mt Tamborine, its a pretty 40 minute drive from Surfers Paradise and a tad over an hour from Brisbane airport. *When you get there you are greeted with a lush, green, rain forest damp township on top of the hill that is far removed from the 10 years of drought in my home town. The cafe and gallery at the front of the property is instantly comfortable and full of charm. *It contains a lot of local handcrafts and artworks and is the sort of place you could easily blow a few hours in. *I didn’t eat while there (as I had a plane to catch) but the food that went past to other tables looked very inviting, next time I’ll allow for a longer visit. Coffee? *Of course they have coffee! *In fact their coffee is grown on the premises, 3 different varietals of coffee grown without insecticides and pesticides, lovingly tendered all year round and hand picked when the coffee cherries are at their peak. *Fermentation and pulping is all done on site prior to the beans meeting the 10kg Has Garanti roaster. *I had a very well poured double espresso, sweet, mid bodied with hints of the coffee cherry fruitiness in the finish… it was good enough to go back for seconds too which is always a good sign. A true family run business where mum, dad and the kids all lend a hand in the process to get from bean to cup with a passion for producing great Australian coffee. We hope to land some of their Aussie coffee as green beans for a future BeanBay but until then I can fully recommend the drive to the cafe for a feed and a coffee (or three) the next time you are anywhere in the area. Oh, I also know what I want for Christmas if anyone is feeling really flush.... this place! Pic1 - The charming cafe and gallery. Pic2 - Kees van Rijssen, the dutch named ex Kiwi *with an honest passion for Australian specialty coffee standing under one of the old growth bourbon section of the plantation. Pic3 - Some of the new varietals growing-up very nicely. Thanks for sharing this Andy, it looks great! ;D Yeah, its beautiful up there. Talk about living the dream. And Kees is a real character and great bloke. Did Kees slip you some of his greens to try out back at the Snobbery, Andy? I had an enjoyable chat to Kees last friday. 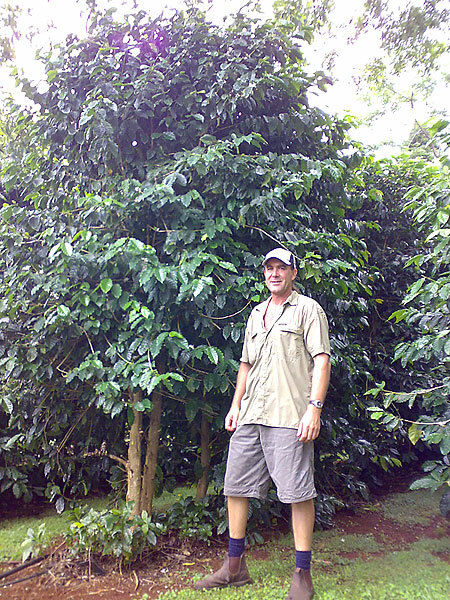 Great guy whos passionate about Australian coffee. Got me some greens to roast at home to try too. Another day in paradise today but what a fantastic day this was for we C.S folks. A trip well worth taking. 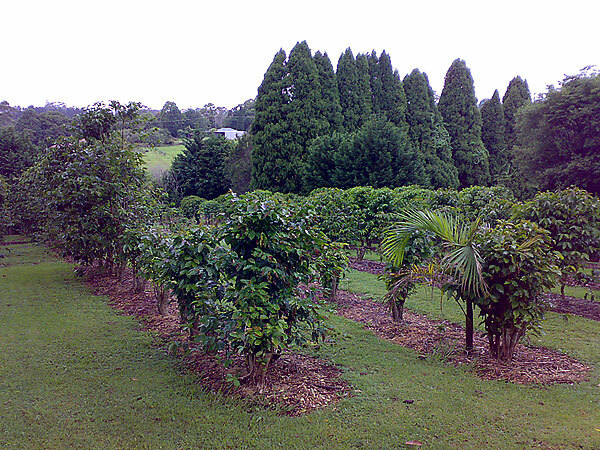 Today I ventured up the Mountain to visit the Mt Tambo Coffee Plantation and I couldnt be happier I did. Upon arrival I was greeted and felt very welcomed to be there. After a quick introduction and pointing out I was a CS member, the lady behind the counter (I presume it was Kesss other half) took my order and said she would go let Kees know there was a snob in the building. Andy I have to say the food was great along with a beautiful short black and flat white. Just as I was finishing my coffee a gentleman entered the building: as pointed out before, what a character. Kees walks in calling out "where is this coffeesnob, he is here somewhere". He pointed out a couple people he knew before bringing his attention to me. "Ah you must be the snob, Welcome, Im Kees"
From that point his attention was one on one till he seen me off. From the moment we left the cafe, I was having Kees explaining to me from what types of plants he had, right down to having a cherry picked of the tree and eating it. We walked out the back and Kees had just finished roast, and what a lovely looking roast it was too. I now have a better understanding between the differences of wet and dry processed beans. The different stages of the end product and so much more. I wanted to buy some green beans, well, enough said. Kees give me 3 different types, 2 wet processed and one dry. It was a real hands on experience for me as I was helping him process the bean I purchased. The beans were all still in the raw form with husks/outter shells on. We sorted/sifted out the smaller beans and any other unwated by-product. I could write so much more about my day there. All I can say is words only say so much. The experience for those that enjoy home roasting is 2nd to none and gives you a real understanding of the amount of time and labour that is needed to produce the end product, the coffee bean. I will finish up with saying I had a very memorable day, one that gave me a whole new understanding to what we know as Coffee, one I would recommened it to anyone who can make it up there. Oh and just so everyone knows, Andy is on Keess wall of fame. 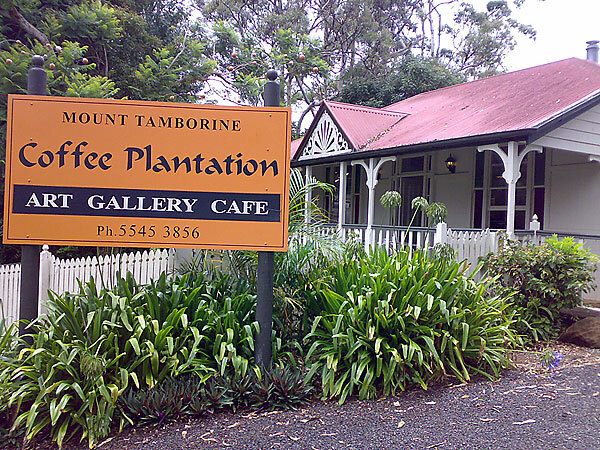 Your visit to Mt Tamborine Coffee does not have to be all day. We had a wonderful tour and chat in just over an hour as we were committed to another adventure in paradise. We took along a "green bean" relative and she was gobsmacked by the cafe and the tour with Kees. Take the family and settle them down in the fantastic ambience of the cafe with some of the delicious food and beverages on offer. Then you can have a chat etc. with Kees whilst the family enjoys the food and the gallery. :) Do not go on the weekend though as MTB coffee is closed enjoying family life. The roasted coffee beans on sale from MTB..to die for. The missus bought a coffee mug which states"I start working when the caffeine does".. A bit of a worry at times. ;D Make it a family trip. They will enjoy the adventure. anyone interesting in getting together for a trip down there in the future? ill start another thread if we get a few......would be a great and informative day! I am but with the job... It is an issue to arrange a time during teh week.. Thus for me its going to be more of a last min dash..
Maybe we could turn it into a CS Meet & Greet and maybe talk Kees into allowing us in on a Saturday or Sunday? Its good to see the Hilton Hotel in Surfers Paradise are using Mount Tamborine Coffee .Congratulalions to all involved.The local coffee industry might finally be heading in the right direction. Took the Bonneville up to Mt Tamborine plantation today, had a great morning, beautiful weather, beautiful coffees, and even managed to get some of Keess greens. Just hope I can do them justice in the HotTop. Kees very passionate about his coffees, and his philosophy around the australian industry, nice and refreshing to hear his points of view. He kindly took time out of his busy day for a long chat and give us a tour of the workings and the plantation. Worth the visit for the coffees alone. So anyway, I managed to get in there on a Weekday that time, rather jet-lagged somewhat and needed a cup of coffee. I started a conversation with the woman at the counter (now I know to be the wife). After I ordered my bag of browns and a bag of green she asked if I was a CS member. And then activity started happening, you sign a guest book, you get to meet Kees. If anybody was seeking for a conversation that day from the me I'd say it was a miserable failure (sadly due to my part, spending 20 hours in an airport to make it to Brisbane and then to drive another hour and a bit, and not to add: poor english I had a laugh)... but then we talked about roasting and my little popcorn popper at home (pfft) and I finally started to get a little bit of energy back (mind you, I was drinking coffee while I was waiting for them to bag the coffee so maybe that helped). I wonder what would happen if I said no to the CS question: do I get the "you don't know what you are missing" stare with the silent treatment - and you must pay cash only? :P just kidding! (they accept credit card but don't really advertise it the little sign was placed high up on a shelf). This year has been a real corker for these guys.The huge amount of quality product being picked is amazing.They are hand picking over 300 kg of prime cherry every day and the fermentation tanks and drying racks are loaded to capacity.The heady aromas of fermentation can be smelt across the whole property.Its absolutely mind blowing how much coffee can come from such a compact property.Aussie grown coffee,alive and well.